Traditionally, every week we bring you a list of the top former Hawks players who continue their career in pro basketball. #1. 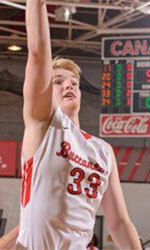 Evan McGaughey (6'8''-F-94, graduated '17, plays pro in Czech Republic) managed to help BK JIP Pardubice to win against the closely-ranked BK Opava (9-12) 89-82 in the Czech Republic NBL on Saturday night. He scored only 2 points and blocked 2 blocks in 11 minutes. 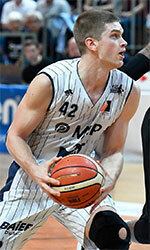 BK JIP Pardubice (13-7) is placed fourth in the NBL. McGaughey's team will play only one more game in the Regular Season. And that game will be critical. It's McGaughey's first season with the team. This year he averages 7.1ppg, 4.5rpg and 1.2apg. #2. Courtney Belger (6'2''-G-89, graduated '12, plays in Germany). He could not help Schalke (7-12) to beat Phoenix Hagen (10-9) in the German ProA (second division). Belger scored 6 points and added 7 passes. Schalke lost 72-86 at home to the higher-ranked (#8) Phoenix Hagen. It was Schalke's third consecutive loss in a row. Belger has individually a very good year with high stats. He averages 16.1ppg, 4.8rpg, 4.7apg and 1.2spg in 18 games he played so far. #3. Godson Eneogwe (6'6''-G/F, graduated '16, currently in Spain) contributed to Villarrobledo's victory against the second-ranked Real Murcia (13-6) 66-62 in the Spanish LEB Silver (third division) last Saturday. He recorded only 2 points in 7 minutes on the court. It was the game of the round between two top 3 ranked teams in group East. Agricola Villarrobledo CBV (13-6) is placed third. There are only three games left until the end of the Regular Season. So now every game is very crucial. This season Eneogwe has very high stats. He averages 16.1ppg, 4.8rpg, 4.7apg and 1.2spg. #4. 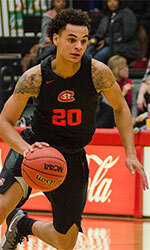 Herm Senor II (5'11''-PG, graduated '17, plays pro in United Kingdom) led Solent Kestrels to a victory over the seventh-ranked Hoods (7-8) crushing them 97-69 in the British NBL D1 (second division) on Saturday night. He was MVP of the game. Senor II recorded 36 points (!!! ), 6 rebounds, 5 assists and 3 steals; quite an impressive performance considering it's only his second season in pro basketball. Solent Kestrels (12-2) is placed first in the NBL D1. Senor II has very impressive stats this year 19.8ppg, 4.9rpg, 6.4apg and 2.9spg in 14 games. Notice: The list above includes only some of the Quincy University alumni playing currently in pro basketball. Check COMPLETE LIST.